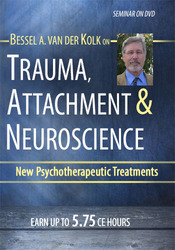 The worlds leading expert in the field of traumatic stress, Bessel van der Kolk, M.D. 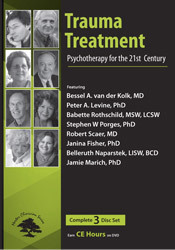 is a clinical psychiatrist who has studied the impact and resolution of trauma on human beings for over 30 years. His research has ranged from developmental impact of trauma to neuroimaging and from memory processes to the use of EMDR and theater groups in PTSD. He is professor of psychiatry at Boston University School of Medicine and medical director of the Trauma Center in Boston where he also serves as director of the National Center for Child Traumatic Stress Complex Trauma Network. He is past president of the International Society for Traumatic Stress Studies. 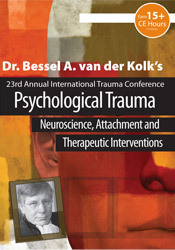 Dr. van der Kolk has taught at universities and hospitals throughout the world. He is author of over a hundred scientific articles, the book Psychological Trauma, and co-editor of Traumatic Stress. Effective treatment of post-traumatic problems needs to include addressing the imprint of trauma on the physical experience of the self as being helpless and in danger. Recovery needs to incorporate dealing with defensive efforts that helped ensure survival, incorporate physical experiences that contradict feelings and sensations associated with helplessness and disconnection. Details: Multi-disc DVD recording with electronic manual and instructions. Author: BESSEL A VAN DER KOLK, M.D. Communicate recent developments in neuroscience in relation to assessment and the treatment of PTSD. Appraisethe efficacy of trauma treatment techniques, including physical mastery, affect regulation, attention and memory processing in trauma. Critique the results of Developmental Trauma Disorder field trials and ascertain how this may inform clinical treatment considerations. 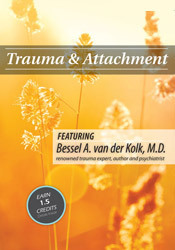 Articulate specific techniques clients can engage in to regulate their own physiological functioning in response to trauma. Explain how traumatized people clients process information and articulate the impact of this on clinical assessment and treatment planning. Determine how to integrate neurologically-based, body-oriented trauma treatment therapies into clinical practice.